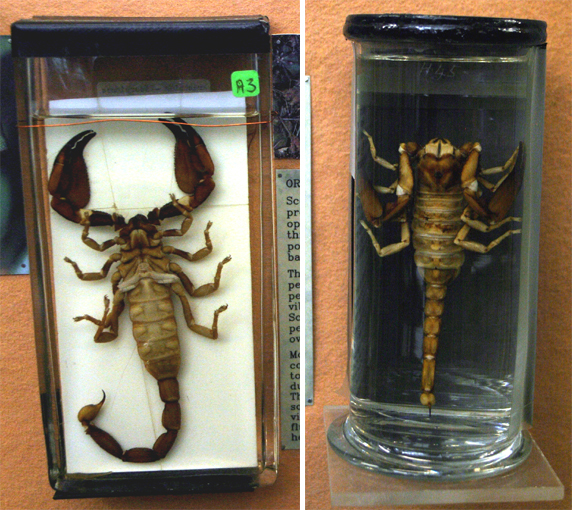 Scorpions have a prosoma or cephalothorax and an abdomen or opisthiostoma divided into a thick pre-abdomen and a thinner post-abdomen ending in a poisoned barb. Their appendages include large chelate pedipalps and comb-like pectens on the ventral surface used to detect prey. Scorpions hold their prey in their pedipalps before bringing the sting over the head. Most often associated with desert conditions, scorpions avoid direct sunlight by hiding under stones during the day and hunting at night.